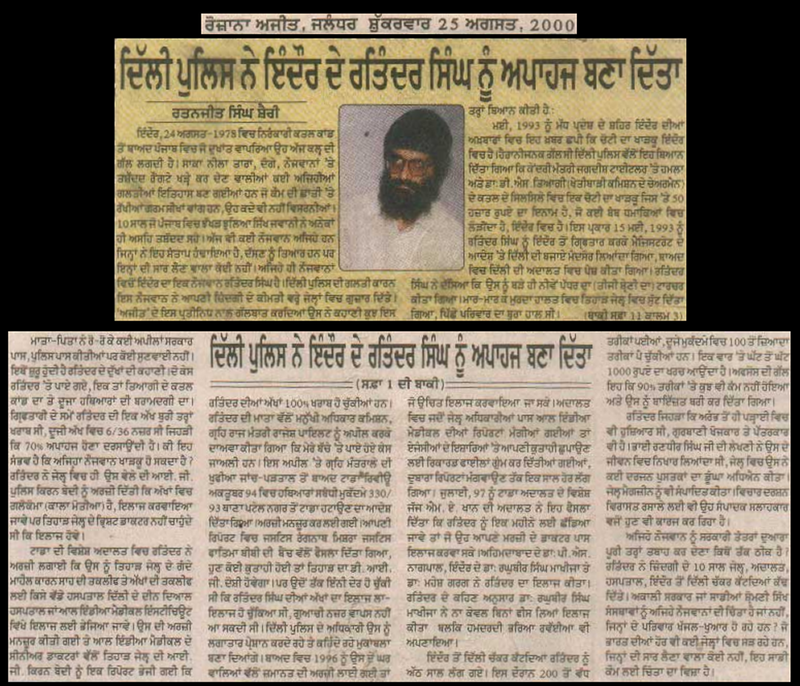 INDORE, MP (SNN) – Sikh organizations in Indore stated that prominent Sikh intellectual and writer, Bhai Ratinder Singh, who spent many years languishing in Indian prisons under fabricated cases, and is legally blind, was falsely accused of supporting and sympathizing with various so-called anti-national and anti-social elements by one of the regional newspapers in Indore. The ‘Sanjha LokSwami’, a Madhya Pardes daily, published a sensational multi-page article, attempting to link Bhai Ratinder Singh to Punjab gangster Neeta (Kulpreet) Deol, who was recently arrested in the city of Indore, referring to Neeta as a ‘Khalistani Terrorist’. Neeta was one of the escapees of the November 27th, 2016 Nabha Jailbreak in which armed assailants freed six prisoners from the maximum security jail at Nabha, Punjab, including Sikh Nationalists Harminder Singh Mintoo-Nihang and Kashmir Singh Galwaddi. 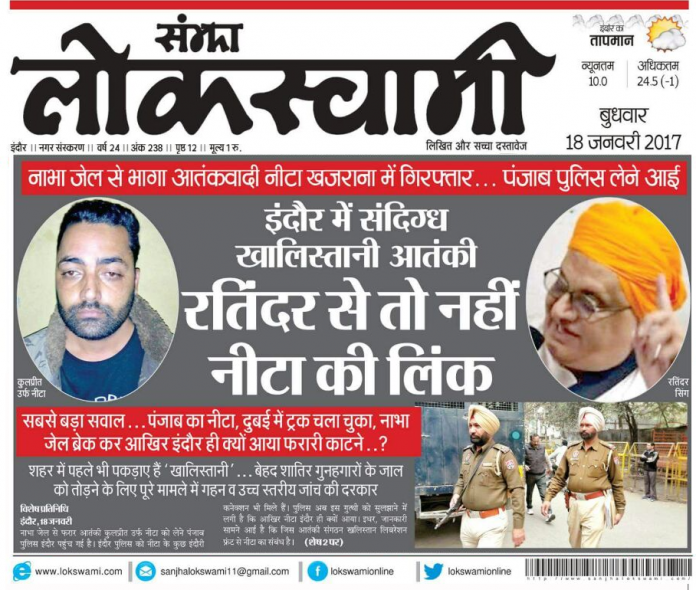 The LokSwami provided no evidence or substantiation of any connections between Bhai Ratinder Singh and Neeta or any other individuals, yet the sensationalized headlines questioning a possible links was splashed across the front page of their paper. Representatives of local Sikh organizations, including Shahbaaz Khalsa, and Akhand Kirtani Jatha, criticized these unsubstantiated allegations and stated that Bhai Ratinder was being targeted by the corrupt hooligans that control the management of Gurdwara Sri Singh Sabha who have political sway in the region due to their connections with the Bhartya Janta Party (BJP) and the Rashtriya Swayamsevak Sangh (RSS), local politicians and police officers. Bhai Ratinder Singh has been a vocal critic of this Gurdwara Management and their association with anti-Sikh elements such as the RSS. In January of 2017, during the 350th Parkash Purab Celebrations for Sri Guru Gobind Singh Sahib Ji, once the the Gurdwara management was confronted about RSS’ involvement in the Gurpurab festivities, immediately threatened and intimidated the local Gursikhs, and filed false police cases against them. Several Singhs were held under police custody under false pretexts due to the management’s actions.